Facilitators: Mark Moore, Sidney Rosario, et al. 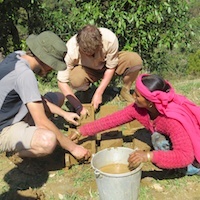 Description: Week-long, residential service-learning programme at the Dharmalaya Institute providing hands-on training in traditional, eco-friendly earthen building techniques of the Himalayas. Learn by doing, in the real-world context of helping to build a few new structures on the Dharmalaya campus. 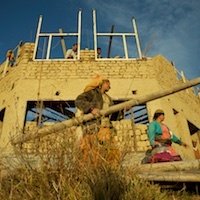 Activities will depend on the needs on site (and the weather), but are likely to include earthen renders (mud plasters), foundations and plinth, stonework, and possibly other methods and techniques of earthen building. After introductions, orientation, and general overview of the programme, we will get straight to work doing various hands-on projects around the Dharmalaya campus, including work on several earthen structures that are in various stages of construction. The main focus during this programme will be on plastering and weatherproofing our newest buildings so they will be protected from the rains. The work might include mud plasters, foundation work, stonework, and possibly other techniques. We may do some water flow management as well, in preparation for the coming rainy season. Practical, hands-on training focus (no theory classes in this workshop). Opportunities to learn traditional methods by working alongside village artisans. You will be working with your hands and body for approximately six hours per day on most days of the programme, so it is recommended to be in reasonably good physical fitness when you arrive, and to bring work clothes. Beautiful, rustic, village setting with a simple lifestyle.